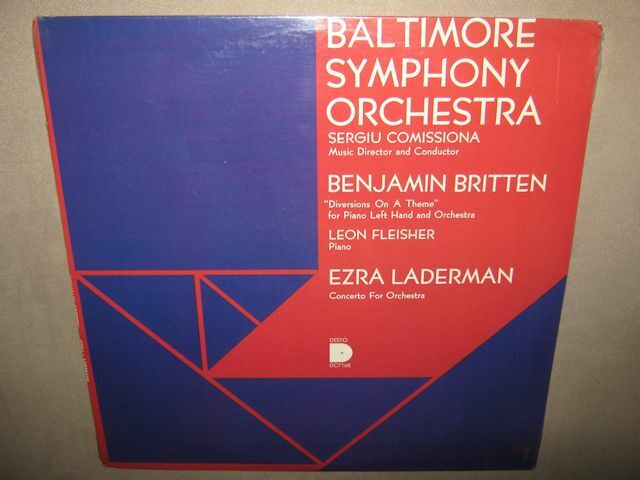 Ezra Laderman Interview with Bruce Duffie . . . . . . . . . Above is volume five of what would eventually be nine CDs of his music on the Albany label. 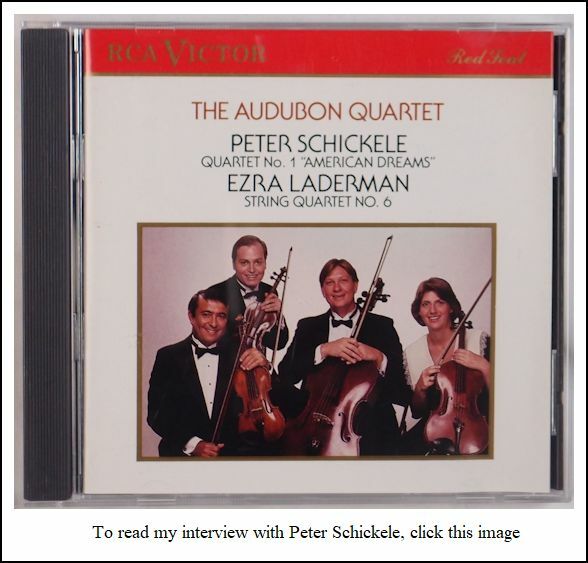 Another volume, with a younger photo of the composer on the cover, is shown farther down on this webpage. 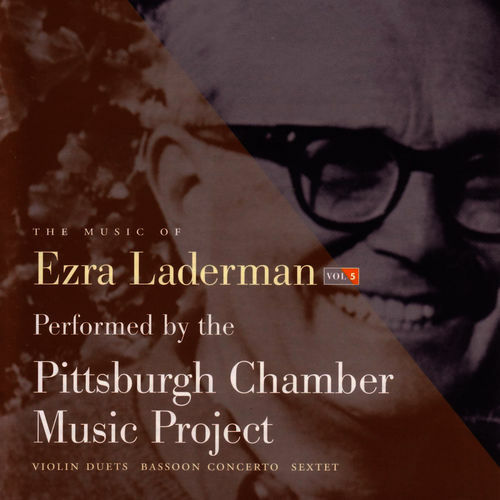 Ezra Laderman incorporated a lyrical style into a contemporary context, using tonal material in combination with atonal elements and seeking out unusual formal structures for his compositions. His writing evolved over the years in that the music, although rigorously conceived, speaks with immediacy and accessibility. Laderman was born in Brooklyn, New York, on 29 June 1924, and died on February 28th, 2015 at the age of 90. His parents, Isidor and Leah, both emigrated to the U.S. from Poland. Though poor, the family had a piano. Ezra writes, “At four, I was improvising at the piano; at seven, I began to compose music, writing it down. I hardly knew it then, but I had at a very early age made a giant step to becoming a composer.” He attended New York City’s High School of Music and Art, and later studied composition with Stefan Wolpe and with Otto Luening. On April 25, 1943, Laderman was inducted into the U.S. Army and served as a radio operator with the 69th Infantry Division during World War II. During the weeks after the war was over, he composed his Leipzig Symphony. This work brought him recognition within the army, and subsequently he was assigned as orchestrator of the GI Symphony Orchestra. He was discharged from the army on April 22, 1946, and after returning to the States, he received his BA in 1950 from Brooklyn College, and his MA in 1952 from Columbia University. He has taught at Sarah Lawrence College, SUNY Binghamton, and directed the Bennington Composers Conference in 1967-68. 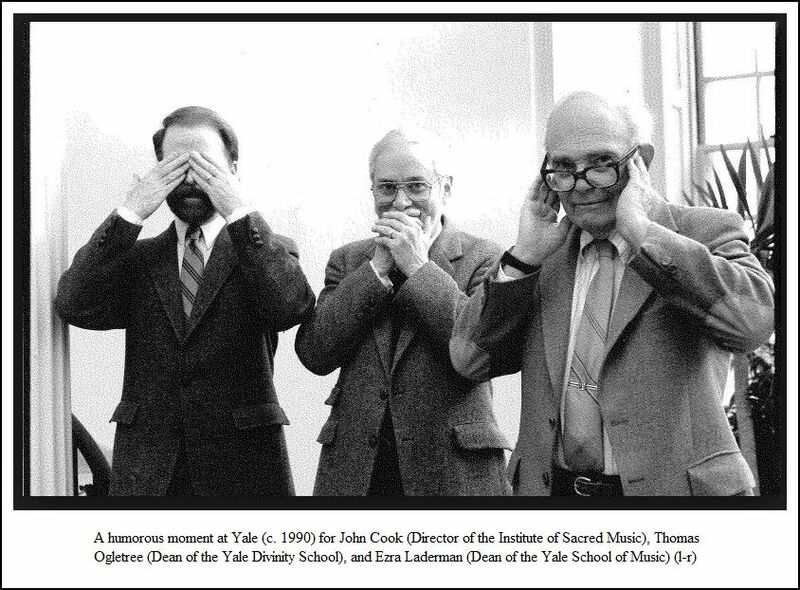 In 1988 he was visiting composer at Yale, and from 1989 to 1995 he was Dean of its School of Music. In the fall of 1996 he was named professor of composition at the Yale School of Music. He received three separate Guggenheim fellowships (1955, 1958, 1964) and the Rome Prize (1963). He divided his time between New Haven, Connecticut and Woods Hole, Massachusetts, where his wife, Dr. Aimlee Laderman (a lecturer at Yale) is a limnologist at the Marine Biological Laboratory. 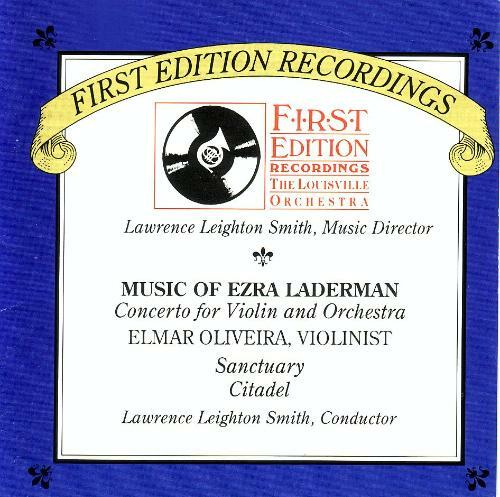 Laderman's compositions range from solo instrumental and vocal works to large-scale choral and orchestral music. His eleven string quartets and his concertos for piano, violin, viola, cello, flute, string quartet, and double winds are notable contributions to the repertory. He also wrote music to the Academy Award-winning films "The Eleanor Roosevelt Story" and "Black Fox," and an opera based on the life of Marilyn Monroe. His eleven string quartets and his concertos for piano, violin, viola, cello, flute, string quartet, and double winds are notable contributions to the repertory. Mr. Laderman incorporates a lyrical style into a contemporary context, using tonal material in combination with atonal or aleatory elements, and seeking out unusual formal structures for his compositions. Commissions have come from the Chicago Symphony, Philadelphia Orchestra, New York Philharmonic, Los Angeles Philharmonic, Minnesota Orchestra, National Symphony, Louisville Orchestra, Pittsburgh Symphony, Dallas Symphony, Denver Symphony, Houston Symphony, New Jersey Symphony, Detroit Symphony, New Haven Symphony, CBS-TV (the oratorio Galileo), the Library of Congress and other orchestras, in addition to commissions from such distinguished artists as David Shifrin, Yo-Yo Ma, Emmanuel Ax, Aldo Parisot, Jean-Pierre Rampal, Judith Raskin, Elmar Oliveira, Julius Baker and Robert Bloom, Nathaniel Rosen, Toby Appel, Leonard Arner, Eugene List, Erice Morini, Samuel Baron, Lenox Quartet, Composers Quartet, Tokyo, Audubon, Colorado and Alard Quartet. Laderman’s opera, Marilyn, based on the life of Marilyn Monroe, had its premiere at the New York City Opera in 1993, and the Symphony No. 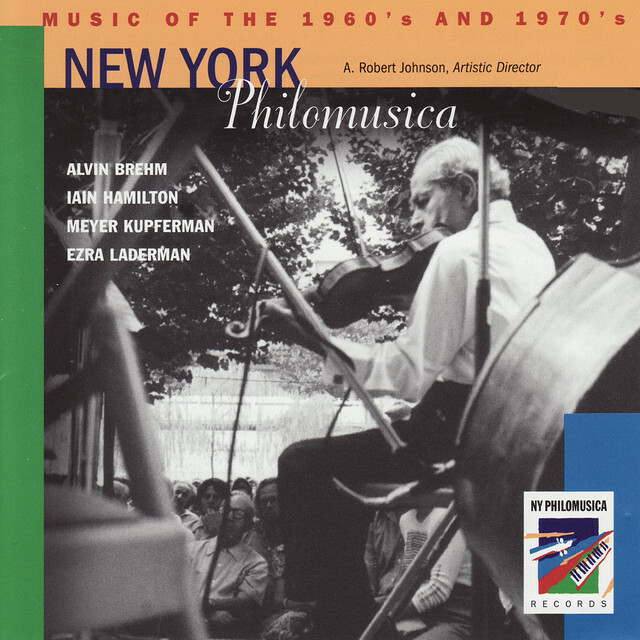 8 received its New York premiere by the New Haven Symphony in Carnegie Hall in 1994. David Shifrin and the Chamber Music Society of Lincoln Center premiered Laderman’s Clarinet Quintet at Alice Tully Hall in 1994. During the years I was with WNIB, Classical 97 in Chicago (1975-2001), it was my pleasure to interview many musicians and present their music and ideas on the air. My main gimmick which was used to sort them out was to celebrate round-birthdays. So, in preparation for his 65th, I contacted Ezra Laderman, and he permitted me to call him in early September of 1988. As I have mentioned previously, a number of composers of Classical Music are (or were) quite interested in baseball. On this occasion, when I called at the appointed time, it turned out that we both were watching our favorite teams — the Red Sox, and the Cubs. To be clear, this was a decade before inter-league play, so it was two separate games... (!) On another occasion, my guest was a Mets fan, and it turned out that we were, indeed, watching the same game. This time, I asked Laderman if he would rather postpone the chat until the final outs had been made, but he wanted to begin. He was in very good humor, and responded to my questions directly and honestly. The following June, the ninety-minute program of music and portions of the interview was well received, and it was repeated in 1994 and 1999. Now, thirty years later (2019), it is my pleasure to present the entire conversation on this webpage. As usual, names which are links refer to my interviews elsewhere on my website. Bruce Duffie: You are both composer and teacher. How do you divide your time amongst the teaching and administrative responsibilities, and the actual composing? 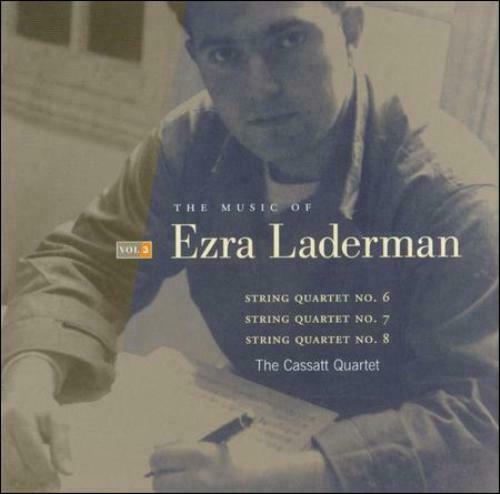 Ezra Laderman: I was really a composer, and I still am a composer. I didn’t do any teaching until my oldest son started going to college. When I saw that he was going to college, I thought that it was of paramount importance to become a responsible daddy, and see to it that I could handle not only his going to college, but two my other children who would be shortly entering college. So, I decided instead of trying to survive as a composer alone, I would embrace teaching as well. What happened at that point was that I was offered a position as composer-in-residence at the State University of New York at Binghamton, and in 1972 I became professor. Until then I had really done very, very little teaching. BD: Is it safe to assume that if, for some reason, you did not have any offspring, you might never have gotten into teaching at all? EL: That’s a great idea, but since I have all these perfect kids, I decided to pay attention to my responsibilities. I taught until 1982, and then I retired from the SUNY system. I’ve done no teaching since then, but beginning next week, I will be in residence at Yale University for the full semester. So, indeed, I’m going back to teaching. I haven’t taught for a number of years, and I’m looking forward to it. I’ve no excuse... I don’t have any kids going to college! BD: Is it with anticipation or trepidation? EL: I guess I’m going back to teaching because I have grandchildren! [Both laugh] But teaching has not been central to my life as a composer, and in many ways I regret that. Those early years have seen some marvelous composers in the United States, with great reputations as pedagogues. Vincent Persichetti comes to mind, as does Jacob Druckman, and Milton Babbitt. There are a number of composers who’ve had long history of nurturing new generations of composers, and I had it for ten years. A number of composers have emerged but, in some ways, I wish I had had many more years. BD: Now, you’ll certainly have a few more. BD: Is musical composition something that can be taught, or must it be innate within each composer? EL: Certainly talent can’t be taught. Talent is innate and inimitable, but what can be taught are the gestures, the routine, the process of learning how to write music. That certainly can be taught. Lots of things can’t be taught, including a growing sensitivity to musical ideas that have merit. None of it can be taught, but you can create an awareness in the student to make the correct decision. BD: Where, then, should be the balance between the creative inspiration and this technical ability? EL: You need both. If you don’t have the tools, having expressions isn’t going to do very much for you. You need the tools to successfully make the gesture into a whole, or it won’t work. The inspiration, or the inspired composer, will have a leg-up, but needs the discipline, needs the structure to be able to deal with it successfully. One without the other will never work. Unfortunately, we have all too many composers who have the tools but don’t have the inspiration... but that’s part of history. That’s another artistic discipline. BD: Is there any chance that we’re getting too many youngsters coming along who want to be involved in the compositional process? EL: That’s not a new problem. That’s been going on ever since the 1950s, when there was a tremendous explosion in the United States of composers. After World War II, the creation of all the state universities, the music departments that flourished, and the beginning of the romance of the composer in academia — which was not so before the war — has given rise to a tremendous number of young composers, and many of them are not that young anymore. So, that’s a problem which evolved in the ’50s, and there isn’t room for them. But nonetheless, they want to create, they have the desire, and we have to give them all a chance. BD: Then, how does society sort through the greatness and the less-than-greatness and the mediocrity? EL: I don’t know if we do it very well, but history does it fairly well. Certainly they don’t do it very well during the lifetime that we’re going through. Hype, and all sorts of sponsorship, and fads, and critical persuasion sometimes can be very damaging to what is truly beautiful and lasting. But history has a way of evening it all out. BD: Is history always right? EL: Whether it’s right or wrong, it’s all we’re left with. There were hundreds of composers composing during Beethoven’s time, and what we have is a handful that remain today that we know of. It’s true of every period of music. That doesn’t change. BD: What are some of the traits that contribute to making a piece of music great? EL: [Thinks a moment] We begin with the fact that the piece has to have an idea. There has to be something that makes it work. It can’t just be notes. There has to be a sense of destiny about where the music is going, whether it’s Bach, or Mozart, or Beethoven, or Brahms. Whoever the composer is, there is a sense of destiny and purpose. Whether it’s innate in the style, whether you are dealing with the Baroque style or the Classical style, within that style there has to be a sense of purpose and destiny, and a sense of balance. Within that, the ideas themselves have to have lasting value. They have to have imagination. They can’t be cut from the same cookie cutter. It has to be something provocative that makes the work stand up over the test of time. There has to be continual interest, whether the interest is based on motivic material, or harmonic material, or rhythmic material, or a combination of all them. These elements have to have real interest in order to make the piece want to be heard over, and over, and over again. I think that really is the secret. People have had to have heard the piece, or actually have learned the piece, and have the desire to hear it again or play it again. I often go to the piano in the morning, before limbering up, and I inevitably turn to The Well-Tempered Clavier of Bach. I just go to any one of the Preludes and Fugues, and play it. Sometimes I practice it, or two or three of them, and I’ve been doing it for thirty some odd years without ever not loving and working through those pieces. I consider them to be one of the great testaments of mankind. They are just amazing in their variety, and in what they do in those two or four pages that each of these works last. They’re a combination of all kinds of things that one can then label great... and that word ‘great’ should be used very sparingly. There are lots of good pieces, but there aren’t that many really ‘great’ pieces. EL: We always have been, particularly in the world of music. We have about a hundred and ten so-called ‘great works’ that people want to hear all the time. They keep being recorded all the time, and it becomes the core of our literature, and is what is done in chamber music, and solo music, and orchestral music. You also have about twenty operas that want to be done all the time. The repertoire in music today in this part of the world, is very, very limited, much more so than in any other creative field. BD: What is the place for the less-than-great pieces, and even the strata under that, in the concert hall and the opera house? EL: They should be heard, and heard frequently. The more the merrier. There’s a point where we wonder how many more times can we hear one of the standard works. It does happen. If you look at the brochures of the orchestras for any season, you see now so many more works that are not considered great because we have almost overplayed our hand. It’s very rare to see Beethoven’s cycles. When I was growing up, Beethoven’s cycles were done all the time. We hear now many more Mozart symphonies. When I was growing up, there were the last three that were heard all the time, together with the Haffner. When I was a young fellow, there were maybe three Haydn symphonies. Now we explore a whole group of Haydn symphonies. Again, when I was growing up, there were the last three symphonies of Tchaikovsky plus Romeo and Juliet. BD: So, you think this is a good thing that we explore? EL: Of course it is! We call them chestnuts, and we play them to death. We now hear them on pop concerts. It’s not at all surprising to hear the first movement of the Beethoven Fifth Symphony, sometimes even with a Rock beat in a pop concert! BD: Is that what makes it great — that it can survive all the playings, and even the rearrangements? EL: Yes, it can, and isn’t that extraordinary? One of the most marvelous things that’s happened in my lifetime is that The Rite of Spring has become a staple. Any orchestra can do it at any quality. When I was a lad, there were maybe one or two orchestras that could do it with any authority. Now you hear it done absolutely magnificently even by the New Jersey Symphony, and other orchestras that would never dare to have done it just a few years ago. It’s absolutely extraordinary. BD: Is this a tribute to the expanding level of the musicians in the New Jersey Symphony? EL: Not only in the New Jersey Symphony — and they’re quite special — but all over the world. With the facility that they have now, they understand it. They have a knowledge of Twentieth Century music which is remarkable compared to where they were twenty, or twenty-five years ago. In the United States, this is a result of what’s happening in the conservatories, such as Juilliard and Eastman. At Curtis they produce these young musicians that are now the chamber musicians, the soloists, the orchestral musicians of this country. They can learn a score of mine in two and half days — five hours of rehearsal — and that’s terrific. BD: The technical performance level of all of the musicians today has gone up considerably? EL: Oh, yes! We hear the criticism that they have the technical proficiency, but they don’t have the musical understanding, or the musical sensitivity of the musicians of a generation ago, and certainly that is true to an extent. But if we give these young kids time, they’ll grow into it. BD: This was going to be my next question, their musical ability. Has it been going up commensurate with their technical ability, and the answer obviously is no. EL: Yes, but it’s not as desperate as you would think. They’re not, perhaps, as understanding in some ways of musicians who have been steeped in a certain literature, but I don’t think there is as great a gulf between technical proficiency and musical understanding as one assumes due to the criticism of the young musicians. They will catch up in their musical literacy, together with their technical proficiency. They get to be good so quick that indeed they have a technical mastery that outruns their musical sensitivity. But that will all even out. BD: We have been talking about performing. Is there a commensurate advancement in the compositional process among the young students today, and even among the younger professional composers? EL: The young composers have a big problem. In fact, being a young composer today is a very exciting and problematic situation, in that gone are all the restrictions of the aesthetic of the two polarities that followed back in the ’50s and ’60s. 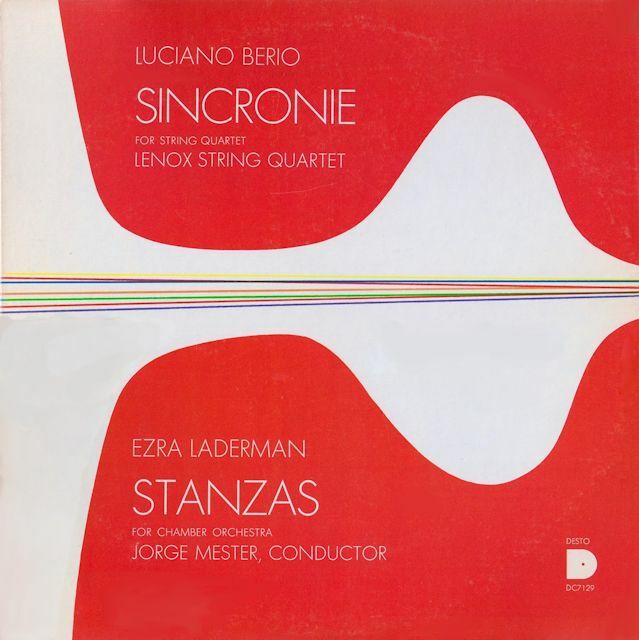 They either were involved in serial techniques, and following the Second Viennese School, emerging and evolving out of the Schoenberg-Webern-Berg tradition, or they were another group — based in Eastman and in lots of other places — where one could foresee going back to the Stravinsky aesthetic, or the Boulanger aesthetic, which had tonality still very strongly embedded in the content. This has all gone, and so now we have young people who have six or seven different ways to go. They can be Minimalist, they could Maximalist, they can follow Serial techniques, or Computer Technology. They could become Neo-Romantic, or they could still stay within the orbit that these Serialists did in the ’60s and ’70s, and remain faithful to composers like Charles Wuorinen, and Milton Babbitt, and Elliott Carter. There’s a whole polarity with a tremendous spectrum. BD: Are these completely separate roads, or are we now constructing a twelve-lane highway? EL: No, I think they’re different paths with their own constituencies, in fact. They may not have their own audiences because there’s a big crossover going on, but I don’t think they are on parallel tracks. They’re going in different directions. Certainly, somebody who is dealing with re-defining tonality, and going to back to the long line, and having motivic ideas, and having developmental processes is very different from the Minimalist, and that’s very different from the Serial technique, etc. These are very different paths to take, and although over the last six or seven years the Minimalists have had the most glamorous direction to follow, most of the young people whose scores I see are being more influenced by Minimalist techniques, more than anything else. But I think that is beginning to change now. BD: So, you don’t encourage any of these students to take up one of these fads, knowing that it will probably die in a few years? EL: I certainly would not encourage them to take up Minimalism, no. But there are things within the Minimalist aesthetic which are fascinating. BD: Is it safe to assume that almost no matter what music is brought to your attention, you will look at it, and perhaps even assimilate a little bit of it into your own imagination? EL: I think it’s too late for that. I’m influenced mainly by me. As a kid, I used to be influenced by lots of composers, but as my style has evolved and matured, my music grew much more concerned with its own evolution than with being attracted to other aesthetics. That happens with every composer, and I’m going to be 65 next year, so it is about time I spoke for myself! [Both laugh] A composer who made that change in his sixties was Stravinsky, when he felt that he was losing the fight against the Serial techniques, and was, extraordinarily, turning 180 degrees, and began to embrace them. That’s very rare. Another composer was Arthur Berger, who, growing up into his thirties and forties, was really quite a new classical composer, again responsive to the Stravinsky milieu. He, too, made a shift, but that’s very rare. Most composers, like William Schuman, Aaron Copland, Vincent Persichetti, and Jacob Druckman evolved, and you can see the history of their lives with each piece as it emerges. BD: For whom do you write? EL: I guess the cliché is that I write for me. That’s really the cliché, but I do. Who else can I write for? I sit at my desk every morning, and I’m writing for me. I have to. I can’t possibly write for anybody else. BD: When you get a commission, how do you decide if you’ll accept it, or postpone it, or even decline it? EL: I’ll only accept a commission if it is a work that I want to write! In fact, it’s a good story... Maybe eight or nine years ago, I got a call from a very nice woman who wanted to commission me to write a work for her three daughters who all played the harp. They were professional harpists, she told me, and I told her that before I write a work for three harps, I had better write a work for one harp. I said I had yet to write a solo work for harp, and was afraid I didn’t know how I would go about it. She got really disturbed with me on the phone, and told me that I was behaving rather poorly. She was coming to me, offering me a legitimate commission to write a work for her three daughters, who were terrific. The next day I had a meeting at ASCAP, and Vincent Persichetti was on the same panel as I was. So, I told this to Vincent, and he bawled me out! He said, “Why didn’t you write the piece??? Give me this woman’s telephone number, and I’ll call her. I’ll write the piece! Why should you turn it down?? ?” I told him I wouldn’t know where to begin to write a work for three harps, and he said, “You should be ashamed of yourself! I’ll call her and I’ll write the piece.” [Both laugh] Of course he was kidding, but I can think of a lot of pieces that people could ask me to write that I wouldn’t know how to begin to write, and that was one of them. BD: At least you had the sense and the fortitude to turn it down. EL: Sure, I could have written it, but it wouldn’t have been a successful piece. [Laughs] Anyway, I do write pieces that I want to write, and sometimes, when it’s an orchestral work and a conductor comes to me, we’ll talk about what kind of piece I want to write. This is happening with a piece I’m writing right now for Rostropovich and the National Symphony. In fact, I’ve just finished orchestrating the second movement. We talked quite a bit about the kind of piece he wanted. I had written my Fifth Symphony for ‘Slava’, and now they’ve come back and wanted another work from me. We were discussing what kind of work it should be, and we went round and round. Eventually we came up with a very provocative idea of writing a ‘Sinfonia Concertante’ for five instruments and orchestra, with each of those instruments not being an instrument that is normally associated with a lot of solo work in the orchestra. BD: Like my instrument, the contra-bassoon? EL: [Laughs] It’s piccolo, soprano trumpet, English horn, bass clarinet, and bass trombone. It’ll be premiered next Spring, and it’s a very challenging provocative work. I’m having a ball writing it. So, the idea of commissions and works to be written is a very interesting one. 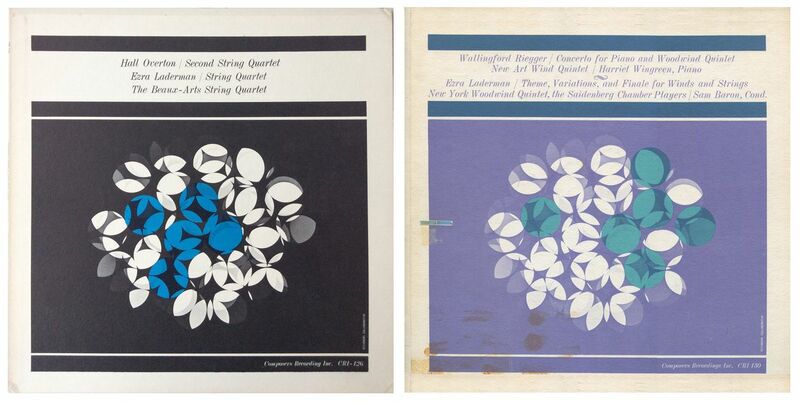 Not too long ago I finished my Eighth String Quartet. There is no way I can tell whether I can write, at this point in my life, a ninth quartet. [He would eventually write eleven.] 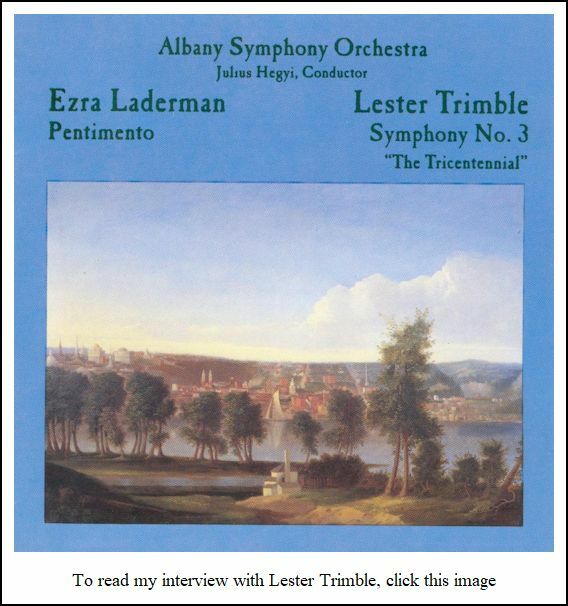 I never thought I’d write eight quartets, but I’ve written in that idiom, and, of course, many other works using a string quartet in an important way, such as a clarinet quintet [the first score page is shown at the top-left of this interview], and a flute quintet. I wouldn’t care who the quartet would be for. I don’t have it in me right now to write another string quartet. BD: But maybe five years from now you might change your mind? EL: I might, yes, but right now I could never do it. BD: Have you basically been pleased with the performances of your works that you’ve heard over the years? EL: Yes, I guess. It’s not that I’m displeased with what I’m hearing. Sometimes the problem is with the composer, not the performer. BD: Then, do you go back and revise the work? EL: Sometimes I do revise. Sometimes early on, I’ve been unhappy with the density, or a number of things, but it’s always been very helpful in that I’ve learned from myself. One of the pieces I’ve written that’s going to be premiered next season (February of 1990) is a Cello Concerto for Yo-Yo Ma and the Chicago Symphony, with Herbert Blomstedt conducting. But you should not say anything about it, because the announcement should come from the Chicago Symphony. BD: I certainly will keep it confidential until it has been made public by them. We were talking about revisions. Suppose some musicologist a hundred years from now digs up the Urtext of something that you revised. Are you going to be mad at them for playing the first version? EL: [Laughs] I wouldn’t care, would I? I wouldn’t be around worry about it. No, indeed they’re all versions of works of mine that one could have a lot fun with, and that is not uncommon with composers. But by and large, most music that’s performed is the final version. You can get publications of, say, the Beethoven Cello Sonatas. There are many different versions of them, but there’s a traditional version that we use most of the time. There are versions of the Schumann symphonies, but there’s a tradition established, and once that tradition is established, it’s used rather predominantly. We don’t tend to use other versions. People like Stravinsky, made revisions for practical reasons. He kept the copyright alive by making revisions a year before the copyright was over, so that way the life of the work was extended, and it didn’t get into the public domain. He was a master making revisions just before the deadline. BD: Is it safe to assume that he wouldn’t have made those revisions if the copyright law had been different? EL: I don’t think he would of at all. It will be interesting to hear what Robert Craft would say about the forty-seventh version of Petrushka, or something like that. Why did he have to do it? He just changed a few notes, and cleaned up a little orchestration. He did it with all his block-buster pieces. BD: And kept getting the royalties. BD: Should the public provide for composers to live off royalties, or should they have to teach in order to send their kids to college? EL: The United States is very different than all the other countries. Also, we have so many more composers, and I don’t mean just in the Soviet Bloc. In Austria there are between sixty and seventy composers that have a certain status, and all of them are supported by the State. BD: Is that a good thing? EL: It’s not a good nor a bad thing, it’s just very different. They don’t have the kind of structure that we have in the United States. It’s really changing tremendously. The fact is that the United States has so many universities, so many conservatories that provide possibilities for composers to create and teach, and it’s not true in Europe, nor in Canada, nor in South America. Those countries have relatively few, and composition is not taught at the university. Rather, it’s taught at the conservatory. There are just a few of those conservatories, so the number of academics that are teaching in Europe and in the Southern hemisphere is much fewer than those in the United States. It’s just a fraction, so you have to be a different kind of animal in order to be a composer in Europe and in other parts of the world. You would have to be independently wealthy, or have a patron, or have a publisher. There’s another societal factor going on. In the United States it’s much healthier, in a way, that a composer can earn his own living, hold his or her head high, and still have time to be a creative artist. This has all developed after World War II. It’s an extraordinary thing, and as a result the composers in the United States today are in the forefront of the world because of that. BD: It’s more letting the market place take care of it all? EL: Any advice that I would give — and there’s nothing one can do about it — is to have a thick skin. Too many talented composers and young composers crumble apart because they can’t take criticism. Whether it’s verbal or written, they fall apart. They must somehow have the ability to withstand that and accept it, and go on to develop one’s craft. In my own class, when I doing my Master’s at Columbia University, we had a class of about fourteen. We were working with Otto Luening, and it was a wonderful class. There was tremendous talent in that class, and of that class, one of the composers who survived with me was named Roy Travis (1922-2013), who was out in California all these years. Every other one, somehow, gave up the ghost. All of them were initially getting performances, and doing the things that young composers do in order to develop some kind life and some kind of career as a composer. But at different points along the way, they all stopped. They all gave it up. So you need a thick skin. You will need to have that ability to withstand the adversity that inevitably is going to come. Somehow you must have enough confidence in your own worth that you can keep going with enthusiasm. So, that would be one bit of advice. EL: [Thinks a moment] Yes. At a particular point in your life, it become dangerous to hear too much new music, to be too bombarded by so many other aesthetic qualities. The composer needs to be together with the Sturm und Drang, with being part of the musical society, hearing concerts, reading scores, and going to festivals. But beyond that, you need a lot of time to be by yourself to let it emerge. It takes a long time. It doesn’t happen very easily to have some kind of uniqueness, and unfortunately — or fortunately — we need to have some uniqueness in order to gain some kind of identity. It’s demanded by us. History demands it. Society demands that each composer, each artist, each painter, each writer have some kind of fresh force. We can’t be clones, and we can’t be redundant. We have to have something new to offer, and it’s not easy to have something new to offer if you are constantly being bombarded, or affected, or influenced by all the stimulus around you. When you’re young, it’s inevitable and it’s healthy. But at some point, you have to say to yourself, “It’s time to step aside a bit to be within myself, and let the music begin to take on some kind of uniqueness.” Some composers are blessed with that uniqueness from the beginning, but that’s all too rare. BD: It’s no good to be unique just to be unique? EL: Of course not! It has to come from within. It has to emerge slowly. It’s not simple. BD: So, then you’re really talking about honesty as a composer. EL: Most composers try to be honest. There are those who write for each other, but that’s another story all together. BD: I thought we’d gotten away from that. EL: We haven’t gotten away from it at all. This is true for young composers, particularly, before they’re caught in the trap of being in a university looking for tenure, finding a publisher, getting recordings, getting grants, and that whole series of things that help establish credentials. Indeed, in order to get those credentials, you have to follow a certain path, because of your peers and because of your mentors. It’s not so simple to break through the pack. BD: What advice do you have for audiences these days? EL: There are many kinds of audiences, but the biggest advice I can give them — which nobody takes — is don’t be afraid to work when you’re hearing new music. Don’t expect new music to be as accessible as a pop song. You work when you read a poem, you work when you look at art, you work when you read a novel. You have to give something of yourself, and you should not be afraid to give something of yourself when you hear a new piece of music. BD: That’s wonderful advice. I’ve never heard it put just that way. I wish people would take that advice. Maybe we should print up little placards with that advice on it, and send them out with the season brochure. BD: Let me ask you about your recordings. Are you pleased with the recordings that have been made of your music? EL: [Sighs] Some of my recordings, yes, but not all of them. Some of the recordings were made on very disadvantageous conditions. I give you one example where the recording will be nameless. It was an orchestral work, and because of the financial structures, it had to be done within three hours. It’s a work that takes thirty-five minutes, and the conductor planned the recording session in such a way that each take, as it happened, used all the musicians that were needed, and then as a musician was no longer needed for the rest of the recording, they were then sent home. Once you do that, you don’t have to pay for that musician after a certain length of time. EL: You have then a recording that’s skipped and jumped all over the place, piece by piece, section by section, until we were left with three or four musicians somewhere in the middle of the second movement. Then, the recording was spliced together. BD: I assume it lost the line completely. BD: It’s encouraging that you’re getting more recordings coming now. EL: Oh, yes, because what’s happening is that I’m getting recordings right after the performances, after they’ve done four or five performances of the work. So, it’s really right there for the orchestra. They know it inside out, and they can get into the recording situation and really go through it with great confidence. That’s been a great help, so that’s been a change for me. BD: Are there some of the older recordings that you also feel are very fine? EL: There are a few I do not want to talk about, but I can tell you about some of the ones that I like... My Second String Quartet is very well done, and that was a CRI recording. 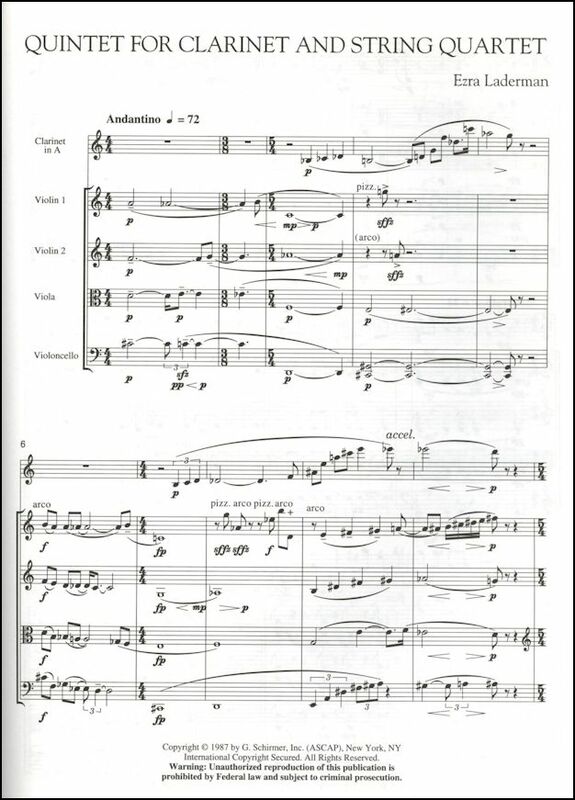 The Theme and Variations and Finale for winds and strings is also on CRI [shown at the bottom of this webpage]. 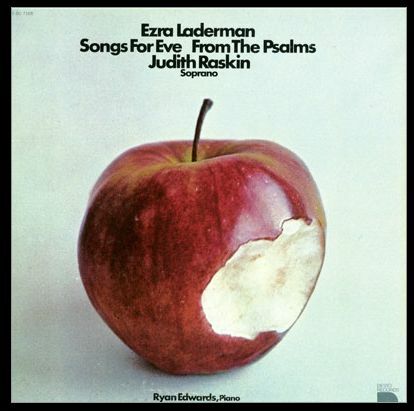 Then there is Judith Raskin singing Songs for Eve and From the Psalms which is beautiful, and that’s on the Desto label. 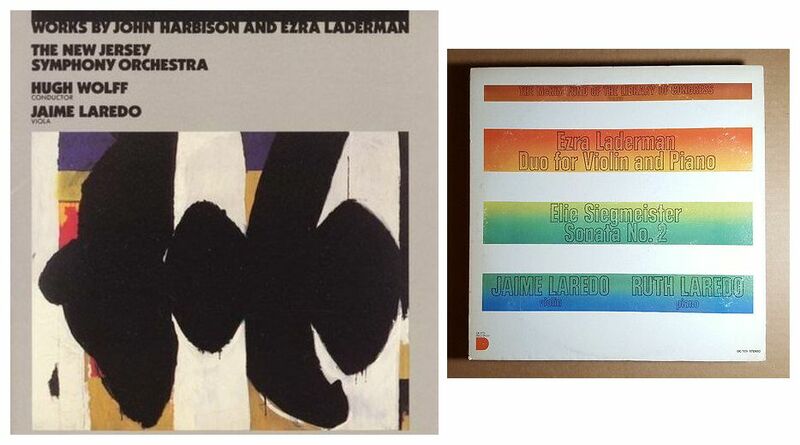 [LP jacket is shown below-right.] Jaime and Ruth Laredo playing my Violin and Piano Duo was done very successfully [also shown at the bottom of this webpage]. BD: Do you like the recording of the First String Quartet? EL: [Interrupting enthusiastically] ...with Samuel Baron. That’s terrific. He’s a great flutist. But the whole business of recording is not simple, particularly in the United States. It’s very difficult, it’s so costly, and the returns are so nebulous. Except for the Minimalists — such as Philip Glass, John Adams, Steve Reich, and maybe one or two others — the audience is not large. BD: What can we do to get more audience for new music? EL: There is an audience for new music, but what I’m talking about is that the buyer for the recordings of new music is not large. It’s much better in the concert hall. It’s much better in the learning situation. Lots of kids are buying new music, and playing new music, but not lots of people are buying the CDs of the new recordings. That’s a very troublesome thing and, as you know, there are fewer and fewer radio stations playing contemporary music. It’s not a growth industry, and the competition is greater and greater. The situation in New York City is really terrible, and what’s happened is they now have only one station that plays new music, and that’s WNYC. WQXR only does it when they are plugged into one of the orchestras that are under contract, and the same with WNCN. The Columbia University station, WKCR, does a little bit, but there’s nothing that’s on a sustained basis. EL: Well, there are only joys. If I had another life as a composer, I’d probably do what Ned Rorem did, which is write lots and lots of songs. I’ve written only a few song cycles, but I’ve written a great deal for the voice with cantatas, and oratorios, and different kinds of works which get fewer performances. But I’ve written a great deal for the voice, and I love writing for the voice. There are two kinds of singers, and I love them both. One kind is the singer who really sings exactly what you’ve written, and they’re great. This includes Jan DeGaetani, and Lucy Shelton. Then there are the other singers who sing with a lot of interpretive feeling, but they bend your music, and they make it into something very personal. I also love those singers, and pre-eminent among those who I’ve composed for is Judith Raskin. Then there are singers that do everything, and do it all beautifully, and the ones who are closest to me and have sung a lot of my music, are people like Sherrill Milnes, and Ara Berberian, and Hilda Harris, and Johanna Meier. I’ve loved writing for the voice, and that’s certainly something that I would want to do more of. If singers were to come to me and say they want pieces... in fact, there was a very interesting commission that I couldn’t accept the last year. A quartet wanted me to write a work for soprano and string quartet because they were going to do the Schoenberg String Quartet which uses a voice, and they wanted a companion work. They wanted to commission me to write a work for soprano Dawn Upshaw and their string quartet, but they needed it too quickly. I couldn’t do it. EL: It’s a shame, yes. That I would have enjoyed a lot. BD: Are there also some operas in your catalogue? EL: I’ve written about six or so operas, and I’m pretty close to signing a contract to write a major opera for one of our leading companies. It’s so close that I’d better not talk about it! BD: That’s perfectly all right. EL: Well, it’s my life. It’s the greatest fun I know — that and playing tennis, and going out with friends. I love to compose. Not so long ago, my middle son was visiting, and I was at my desk. He’s been used to seeing me at my desk all of his life, and he put his hand on my shoulder and said, “Dad, what are you grinding out today?” [Shocked] I couldn’t believe it! I don’t think of that at all. I sit at my desk for four or five hours every morning, and it’s not grinding out. It’s great fun! I love doing it! What I love most about what I do is that part of the world of composing, the act of composing. I’m in charge of everything. It’s my world, my life that I’m conjuring up, and dealing with. Everything from that point on is some kind of a trauma, whether it’s the publisher, or a rehearsal, or the performance, or the critical response, or a recording. All of the trappings of that world have problems, but the actual act of creation is what I love to do. The worst thing about composing music is that when I finish a piece and hand it to my publisher, I’m on to the next piece. I can’t do any of the things I’m supposed to do. I’m the worst marketer of my music that one could think of. Once I hear the world premiere — and I’m there for the world premiere, wherever it is — I’m not the sort of composer that goes running around to be in attendance to hear the works done, to see whatever I can get out of it, and be at the social things, or political things, or extra-musical things. I’m terrible at that. I know composers who make a career of always being on the spot, and being where their music is done, and things happen as a result. But the reason is that I don’t want to take the time. I’m at my desk, and I’m busy doing my next piece. BD: I hope you don’t want to disown any of your old pieces. EL: That piece is over, and it’s been realized, and now it’s in the hands of the gods. If it lives, it lives, and if it doesn’t live, what can I do about it? I’m certainly interested in the first performance, yes, hoping that it goes right, and trying to do whatever I can to see that it goes right. That’s very important to me, but when an orchestra takes a piece of mine on tour — and it’s happened a number of times — I can’t go wandering around with the orchestra. That’s no fun! BD: Are you ever pleasantly surprised by a performance of a work that you hadn’t heard in twenty or thirty years? EL: I’m pleasantly surprised if the piece is done! EL: I’m sure that’s so, and when I hear a piece of mine that’s been brought back after I haven’t heard it for a long time, then I hear lots of new things, yes. If I’m happy about the piece, then that delights me even more after I’ve not heard a piece for some time, and that happens. I don’t want to change anything. I want to leave things the way they are, because that’s the piece, and it reflects a particular point in my life. I don’t do what Stravinsky does. The piece stays as I wrote it because it’s a testament to where I was at that time, and I don’t fuss with it any longer. I don’t think I would help it, anyway. When you are away from a work for a length of time, the best you can do is be a good audience, and enjoy it if you can. BD: When you’re working on a new piece, do you work on one at a time, or do you have a couple of things going at once? BD: And it came off all right? EL: It did, yes. It was terrific! When the piece gets done, and it’s set, it’s finished. But it’s a good question. Sometimes you can’t be sure. There are obvious questions about knowing exactly when a movement is over, or a piece is over. If you saw the original scores, the short scores of works of mine, you would see all kinds of changes. It looks like a movement is over, and then three days later you can see another two pages, or another six measures have been added. Or sometimes there’s a little condensation going on, and I’ve eliminated a bit. It does happen. BD: When you’re writing, are you always in control of the pencil, or are there times when that pencil is really pulling your hand? EL: No, no, no, I’m in control of it. Alan Hovhaness has a better way of doing it to me. His hand is an extension of God’s will, and so he doesn’t have to worry. I have to constantly make an awful lot of decisions, because I’ve got nobody to lean on but me. In some ways it’s possible that he was the extension of God’s will. I’m not being facetious. It’s a very deeply thought attitude, and it has nothing to do with whether the piece is good or bad. It just has an awful lot to do with the confidence that the composer has in putting down notes. BD: I assume that you’re confident, at least to a certain degree. EL: Well, there has to be some confidence, because I write an average of two or three works a year, and I’ve at it for about thirty-five years. Not that I am as productive as a lot of other composers, but there is enough confidence that I’m able to write these pieces, and feel pretty well satisfied with the way they turn out. If not confident, at least I have the ability to see things through to some kind of an end. BD: I hope for lots more pieces from your pen. EL: Wouldn’t that be great? Who knows? BD: Thank you so much for being a composer. EL: Thank you for asking me such nice questions. This conversation was recorded on the telephone on September 7, 1988. Portions were broadcast on WNIB the following year, and again in 1994 and 1999. This transcription was made in 2019, and posted on this website at that time. My thanks to British soprano Una Barry for her help in preparing this website presentation.